70. Classes of People in the Middle Ages. In the Middle Ages people lived very different lives from those which we lead to-day. Now we have many different occupations, and a man may be a farmer, a merchant, a lawyer, or follow any one of countless trades or kinds of business just as he sees fit. One who does not like the quiet life of the country may move to some town or bustling city and enter any trade he prefers. We think it scarcely honorable now for a person, even if he has a large fortune, not to engage in some useful work. But in the Middle Ages it was not so. During the earlier part of that time there were no towns or cities, and everybody lived in the country in much the same way. Later, towns and cities began to grow, but they were always small as compared with those we know to-day. All the people who lived in the country—that is to say, nearly everybody—belonged to one of three great social classes. There were the clergy, such as, the bishops, priests, and monks who carried on the work of the church; the peasants, who tilled the fields and did all the useful labor; and the nobles, whose business it was to fight and to rule over the peasants, but wfio often spent much of their time in doing nothing at all that was useful. Whether a man was peasant or noble depended on his birth, for though a peasant might possibly rise to a noble position, this hardly ever happened. A man of any class might, of course, join the clergy. A peasant could do so, however, only with the consent of the noble on whose land he lived. 71. How the Nobles Lived. The nobles of the Middle Ages were fierce and proud people. They had high-sounding titles, such as Duke, Count, or Baron, which their ancestors had received from the king in return for services they had done on the battlefield or in council. All the land which did not belong to the church they owned, and they looked down on the poor laboring peasants who lived on their estates as hardly better than cattle. Not all of them indeed were cruel or wicked, but they believed that their "gentle blood" made them far superior to other people. The chief business of the nobles was war, and their amusements were warlike games and hunting. They lived in great fortified buildings called castles, generally set on some steep hill so that the enemy could not easily reach them. In early times the castles were only "stockades" of logs, but later they were made of stone and, as men learned more and more about building, they came to be great structures with massive, walls, huge towers, and frowning battlements. A ditch filled with water which could be crossed only by a drawbridge gave still further protection. Since gunpowder was not known in the Middle Ages, it was very seldom that a castle could be captured by an enemy except after a long siege. Behind the walls of his strong castle a great noble sometimes defied even the king himself. So massive were these buildings, that after all these centuries their ruins are still to be seen everywhere in Europe. But though the castles were good forts they would seem to us dreadful places in which to live. Since the walls were so thick and the windows only slits for shooting arrows, the rooms were usually small and dark. Though in the "great hail" there might be a huge fireplace and a roaring fire of logs, most of the castle was cold and uncomfortable. There was little furniture, and the floors were strewn with rushes in place of carpets. Doubtless the family and "men-atarms" spent much time in the courts, or "wards," as the open spaces inside the walls were called. Yet only strong men and women, used to cold and discomfort, could live, in such places. Hard indeed must have been the lot of the ladies in these castles, for they could have little share in the exciting occupations of the men. For them there were very few books in the Middle Ages, and little to learn save to play some musical instrument or to weave the quaint tapestry which sometimes adorned the grim stone walls of the cheerless rooms. What a bright day it must have seemed when some wandering minstrel visited the castle to play and sing, or when some juggler came to amuse them by his tricks! But, though boys of noble birth were seldom taught even to read, they had much to learn, for every noble must be a soldier, and the trade of arms in the Middle Ages was hard to master. 72. Warfare in the Middle Ages. 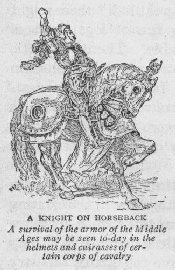 The noble always fought on horseback and clad in complete armor. At first this armor was made of small metal links, like those of chains, sewed close together on stout cloth. Later men learned how to make better armor of steel plates. This armor was so heavy that it took years of practice before one could bear it easily or fight in it well. Only the strongest horses could carry the armor-clad men, and sometimes when a warrior fell from his horse he could not rise from the ground, and so was easily captured by the enemy. The heads of the knights were protected by steel caps or helmets, and they carried shields on which were painted the coats of arms of their families. Their chief weapons were the lance, a long stout spear, and the sword, or battle ax. When the knights fought, each one leveled his lance and charged upon his adversary, seeking to overthrow him by the shock. Any other kind of warfare was difficult for men in such heavy armor. So well protected, however, were the knights that even in hard battles not many were slain. Indeed, it was thought a more noble deed of arms to capture another- knight than to kill him. Then a ransom, that is, a large sum of money, might be asked for his release. 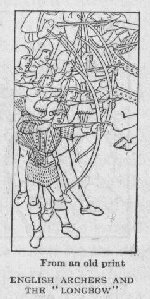 Slings, bows, and other weapons were used in the Middle Ages by soldiers who fought on foot, but they seem to have been of little value against men in armor. One knight on his great war horse was more than a match for many light-armed footmen. It was only toward the end of this time that the sturdy farmers of England learned to use a bow six feet long which shot with such force that with it they could mow down even "noble knights." 73. Warlike Games of the Nobles; the Tournament. So eager for war and adventure were the nobles that times of peace seemed dull. Even hunting, of which they were very fond, was not exciting enough. So they had "tournaments." These were simply play-wars in which knights contended, either in single combat or in opposing troops. 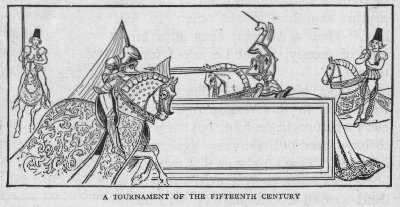 A tournament in the Middle Ages was often a great occasion. Galleries were erected from which the ladies might view the combats and applaud their champions; and high nobles and even kings in splendid costume eagerly attended. The knights in their shining armor, with colored streamers fluttering from their lances, made a gallant picture. at one end of the "lists," as the tournament ground was called. Then, when all was ready, the heralds sounded a blast on their long trumpets and the knights, spurring at each other, met with a mighty crash which often shivered spear and shield, and unhorsed one or perhaps both of the combatants. For the victor was great glory, and whoever held the lists successfully against all comers was crowned with a wreath by the Queen of Beauty, a noble lady whom he himself was allowed to choose. It was rough play indeed, and fatal accidents often occurred, especially as the knights sometimes fought with sharp weapons as in real war. But many thought life itself a little thing to risk for glory and renown. 74. What Feudalism Was. In the United States to-day all men alike are governed by the President and a Congress whom we ourselves elect, but in the Middle Ages such an arrangement was unknown. Every country in Europe had a king or an emperor at its head, but he generally had little power. Each noble ruled like a little king over the peasants who lived about his castle, and the nobles themselves were joined to each other by an arrangement called "feudalism," which seems very queer to us. It was the rule that every noble must be the "vassal" of some "lord." When by the death of his father a young man inherited his castle and estate he must visit this lord and go through an interesting ceremony called "homage." In the great hail of his strong castle the lord seated himself. Then the new vassal, in full armor, knelt before him and swore a solemn oath, with his hands between those of the lord, that he would be faithful in everything that was required of a vassal; that he would love whatever the lord cherished, and hate when he hated. Then the lord kissed the vassal and raised him to his feet. Finally there was put in the vassal’s hands a twig or a piece of turf taken from his own estate, and perhaps a vessel of water from one of its streams. This was done to show that the lord now gave the estate to him. Thus the ceremony ended. It might seem to us a rather mean thing thus to kneel before another more powerful man. But in the Middle Ages homage was thought a ceremony honorable both to the vassal and to the lord. Under feudalism most nobles were, of course, both lords and vassals at the same time,—lords over lesser men and vassals to some still more powerful noble, perhaps to the king himself. After the homage had been performed, when the lord rode forth to war it was the duty of the vassal to go with him and fight by his side. From time to time, too, he must attend the lord’s council or court, and give him his best advice. He must entertain the lord when he came to visit his castle, and aid him by gifts of money on certain occasions,— as when his eldest daughter was married, when his eldest son became a knight, or when the lord himself was captured by his enemies and his ransom must be paid. Other duties the vassal often had also. Yet the lord could not ask him to do anything he pleased, but only those things which custom required. In return for this faithful service the lord was bound to protect his vassal from his enemies, to see that he had justice done him, and to look after the education of his children should he die when they were still young. So both the lord and the vassal were thought to profit by the agreement. Since all the nobles were thus bound by solemn oaths to love each other, one would think that they must have lived together in peace. But such was not the case. These people were fierce and loved war. Many would never do what they had agreed unless compelled by force. Moreover, feudalism often raised puzzling questions, for a powerful duke or count would have many vassals who usually quarreled with each other; and a noble who owned more than one castle sometimes had a different lord for each one. So war raged nearly all the time. It was not like the wars we have to-day, when one nation fights against another, but rather like the quarrels of one man against his neighbors. Sometimes a vassal attacked his lord because he said he was unjust; often a lord made war on his vassals because they would not do what was required. Powerful neighboring dukes or counts constantly attacked each other or joined to oppose the king. Everywhere was heard the clash of arms and the clattering of hoofs as the knights rode forth on their expeditions. But the worst part of it all was that the chief loss usually fell on the helpless peasants. A noble, if he found his enemies too strong, fled to his strong castle, and defied them; but the poor peasants had their houses burned, their crops stolen or destroyed, and were fortunate if they did not starve to death. Is it any wonder, then, that for centuries people in Europe made little progress and had barely enough to eat? Good kings tried hard to make the restless nobles obey the laws and keep the peace. But the nobles were so strong that for many centuries little could be done except by very powerful rulers, such as Henry II of England, or the celebrated St. Louis, king of France. Only very gradually, and not until almost the end of the Middle Ages, did the power of the king become really supreme, and even then only in certain countries of Europe, not in all. The pope and the clergy also tried hard to stop the bloodshed which feudalism brought. Though they did not succeed entirely, they often did more than the kings. For example, they made a rule that all wars must stop from Thursday night until Monday morning, as well as on the days held sacred to saints. Even most of the fierce feudal nobles were afraid to disobey entirely the orders of the church. 75. Chivalry and Knighthood. But fierce as they were, we must not think that the nobles of the Middle Ages did not have some lofty ideas. One of them was "chivalry," which taught that every boy of noble birth should strive to be a true "knight" and every girl a "lady." A true knight was a brave warrior who feared nothing, who was always ready to fight for the poor or the unfortunate, and who would never do a mean or underhand thing. To perform a gallant feat of arms, or to help any one in distress, he would gladly risk any danger and never ask for pay. A true knight must be a good Christian and serve the church. But most of all he was to select some noble lady for whose sake he would win renown and whose smile would be his highest reward. Thus he might wear her glove on his helmet amid the clashing blows of the tournament, and, if he were successful, have the high honor of naming her the Queen of Beauty. Every noble lady was taught to honor bravery and self-sacrifice, to encourage her true champion to high deeds, and to be courtly and gracious to all. The ideas of chivalry marked out for each young noble what he was to learn. At about the age of seven his training began. Usually he was sent by his father to the castle of his lord or to that of some other famous knight. Here he became a "page." 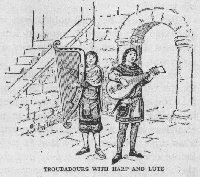 He waited constantly upon the lord and his wife, and by the ladies of the castle was taught courtly manners and perhaps how to play and sing. But when he grew strong enough for more active tasks, perhaps at fourteen or fifteen, he became a "squire." He now attended more especially upon the lord. He must care for his horses, keep his arms bright, and go with him on his campaigns. Meanwhile, under the direction of his lord, he practiced constantly in the use of arms, learning to ride, to wear the heavy armor, and to wield the lance. The older squires fought beside their lords in battle. Finally the time came when the squire was ready to be made a knight. 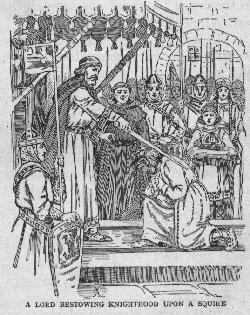 The giving of "knighthood" was an impressive ceremony. After bathing and arraying himself in the required costume of red, white, and black, the young man was required to watch for a whole night before the altar of a church in which his weapons and armor had been placed. In the morning he attended mass and then, in the presence of all his family, friends, and vassals, advanced to his lord and knelt. The lord drew his sword and with the flat of the blade smote the young man on the shoulder, saying as he did so, "In the name of God,’ St. Michael, and St. George, I dub thee knight. Be brave and loyal." Then the newly made knight arose joyfully, and leaping upon his horse showed his skill in riding and in the use of his sword and lance. The ceremony ended with a great feast. The training in chivalry was high and noble, and the world has never forgotten the word or its meaning. We still read with admiration the beautiful stories of knights of old, like the mythical King Arthur and his companions of the Round Table, or the real St. Louis, the brave and blameless king of France. Even to-day, when life is so different, men applaud a knightly deed. Yet, it must be said sadly, in the Middle Ages there were few true knights. The men who so solemnly received knighthood only too often immediately forgot what it meant and were faithless and cruel. Perhaps even these reckless and quarrelsome barons were better, however, for having thought at least a little of the duty of being brave and loyal. The Leading Facts. 1. In the early part of the Middle Ages all the people were divided into three great classes,—the nobles, the peasants, and the clergy. 2. The nobles ruled over the peasants. 3. They spent their time in fighting and in war-like amusements. 4. Their dwellings were great castles. 5. These were built as forts and were cold and uncomfortable. 6. The nobles delighted in the play-wars called tournaments. 7. All the nobles were joined together by an arrangement called "feudalism." 8. This did not give peace, but caused continual fighting. p. The idea called "chivalry" did something to make the nobles better and less savage. Study Questions. 1. 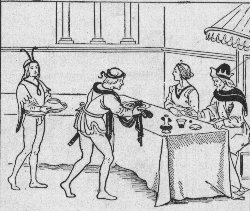 Why was it that people during the Middle Ages could not easily change from one occupation to another? 2. Describe a castle. 3. Why would life in a castle seem very uncomfortable to us? 4. What did the ladies do in the castles? 5. What did the boys learn? 6. Tell about the ways of fighting used in the Middle Ages. 7. What were tournaments? 8. Describe a tournament as if you yourself had been one of the spectators. /9. What was "feudalism"? 10. What is meant by "lord" and "vassal"? 11. Tell about the ceremony of homage. 12. 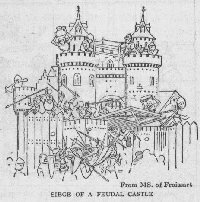 Why was there so much fighting in the days of feudalism? 13. How were the wars different from those of to-day? 14. What powers tried to keep peace? 15. What did "chivalry" teach? 16. Tell how a young noble was trained. 17. Describe the giving of knighthood. Suggested Readings. Tappan, When Knights Were Bold, 1-101, and Euràpean Hero Stories, 118-124; Harding, The Story of the Middle Ages; Retold from "St. Nicholas": Stories of the Middle Ages, 72-86 Also: Lanier, Boy’s King Arthur (Scribners, N.Y., 1911), 50-95; Stevens and Allen, King Arthur Stories; Warren, King Arthur and His Knights; Greene and Kirk, With Spurs of Gold, 7-85.